The Aborigines called Mount Gravatt 'kaggur-mabul' or 'caggara-mahbill', meaning 'place of echidna' or 'echidna rests here'. Logan and Mount Gravatt–Capalaba roads were both probably Aboriginal tracks. Aborigines from the Holland Park and Mount Gravatt areas often held corroborees in Holland Park and travelled as far afield as Slacks Creek. Well-known campsites were at Mott Park, where corroborees took place, and at the top of Selborne and Springwood streets. Mount Gravatt was named by a surveyor called Dickson around 1840, after Lieutenant George Gravatt, who was Commandant at Moreton Bay for three months in 1839. Mount Gravatt East was first gazetted as a suburb in 1967. Mount Gravatt and Mount Gravatt East owe their development to dray and coach traffic along Logan Road. In the 1850s a Mr Wilson began a sheep run in the area, and by the end of the decade, many other people were running sheep there. Cobb and Co began a run through Mount Gravatt in 1864. In 1865 the government held the first major auction of land along Slacks Road in the Mount Gravatt district. German immigrants who began growing fruit and some general agriculture bought much of the land. Frederick Wecker owned a great deal of the land on the slope, and Steigmann opened a winemaking business near the corner of Logan and Shire roads. 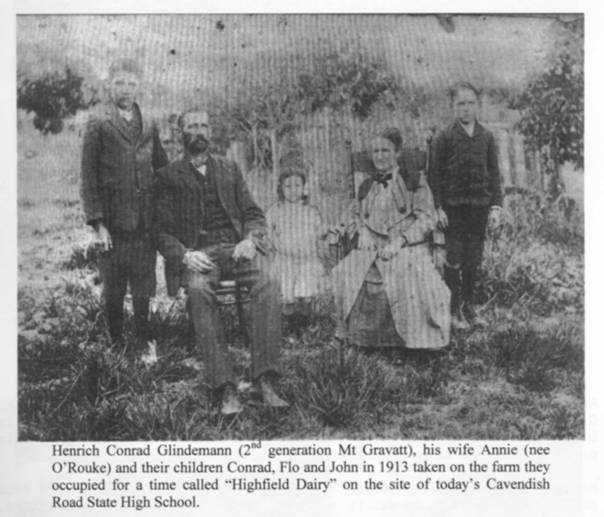 Conrad Glindemann bought land and began Glindemann's Heighfield Dairy. In 1865 a postal line from Brisbane to Logan passed through Mount Gravatt and in 1877 a post office was established. The first school in the area was opened in 1874, with John Stewart Beech as headmaster. While general farming and fruit growing dominated Mount Gravatt East until the 1890s, land for homes in the Overton and Blantyre estates was sold in the 1880s and in 1891, respectively. At that time other development took place, particularly around Creek and Broadwater roads. In 1885 the first section of railway to Beenleigh was opened and extended to Southport in 1889. This drew traffic away from the Mount Gravatt area and hampered its development. The Cobb and Co service stopped and a horse-drawn bus service into town or to the Woolloongabba terminus was established. Development had stopped by the end of the First World War, although afterwards the government resumed a lot of land for returned soldiers and several poultry farms were founded. Throughout the 1920s Mount Gravatt was still a village isolated from Brisbane. Census figures showed that from 1871 to 1911 the population only increased from 46 to 155. In 1929 the Sunday Mail described it as 'a prosperous general, poultry and dairy farming district, with occasional fruit orchards and piggeries'. Very little development happened in the area until after the Second World War, when the Housing Commission began building from Creek Road to Cavendish Road, to meet the housing shortage, and the Chester Housing Schemes began. In 1949, George Chester bought twenty-five acres [10.1 hectares] of land at Mount Gravatt and cut it into 100 lots. In seven months he had ninety-five houses and thirteen shops built. Over the next ten years he built a multitude of houses, starting a massive rush of residents to the area. The first water supply was in 1950 and the arrival of the tram in 1951 further accelerated growth. In 1950 there were only 249 pupils enrolled in the school, but by 1960 there were 1,160. In 1970, after six years of planning and construction, the Garden City Shopping Centre opened in Upper Mount Gravatt, and the spread of the area was ensured. Johann Heinrich Conrad Glindemann, his sister, Katherine, and brother, Andreas, left Hamburg for Brisbane on the Cesar Goddefroy in 1863. In 1864 Conrad married Magdalena Kuder. They bought twenty-six acres (10.5 hectares) of land in the Holland Park area and began to clear it with the help of Henry Klumpp. Conrad built a slab hut and bought two cows from Frederick Wecker. In 1865 Glindemanns Heighfield Dairy began. Conrad would milk the cows every morning and then carry the milk in buckets on a yoke on his neck to his nearby customers. He would then walk to South Brisbane and work all day on the wharves, and walk home again at night in time to milk again, collecting his empty buckets on the way. Later he extended his property to 100 acres (40.5 hectares) and it became the largest dairy farm in Brisbane. His brother Andreas established the German Bridge Hotel on Logan Road near Marshall Road in 1880. This grew into the locality of German Bridge. The Glindemann family home was located on the site of the Cavendish Road High School. In 1912 Conrad died and when his wife died in 1940, she had lived on the family dairy for seventy-five years. George Chester was known as the 'Banana-ease Baron'. He began as a fruit hawker and became Australia's largest banana farmer. After the Second World War, he was having trouble getting packing cases, so he bought a sawmill at Pimpama. He was refused a permit to sell the extra timber milled so he used it to build housing estates at Mount Gravatt. He milled the timber, established a tiling company, and arranged for someone to supply baths for the hundreds of houses he built on the huge area of land he had bought. He developed four housing estates at Mount Gravatt between 1948 and 1953. The houses were all made to one of ten basic designs, but there were variations in colours, roofs, and other details. This started a rush of residents and made him Brisbane's first large-scale property developer. He retired to grow roses in 1963 and died in 1968. The first Mount Gravatt Agricultural Show was held in 1915 in the paddock behind the Mount Gravatt Hotel. In 1918, the Mount Gravatt Show Society bought the land for the showgrounds, which are on the border of Mount Gravatt, Mount Gravatt East, and Upper Mount Gravatt. In 1930, a new school was built on a site behind the original Mount Gravatt State School, and the original school building was moved to the showgrounds. In 1938 the land was transferred to the Brisbane City Council for 'showground, park and recreational purposes'. 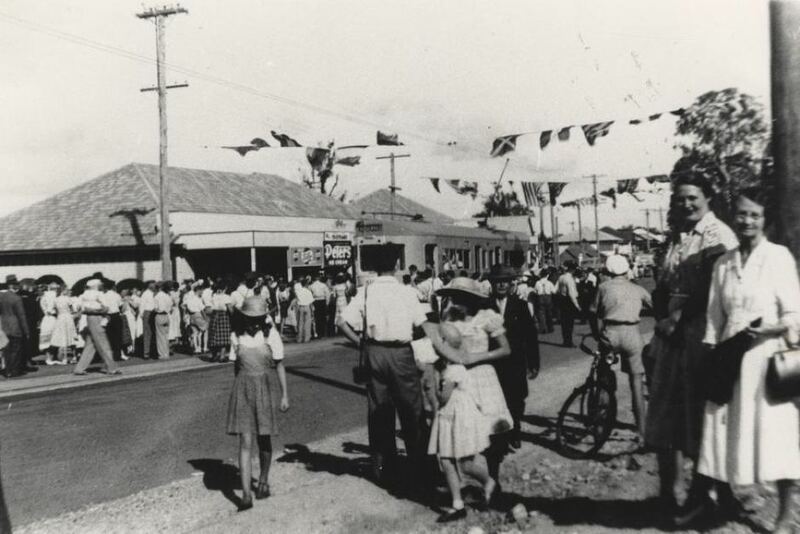 During the Second World War the United States Army used the showgrounds for an Indonesian and Dutch camp, although later they were taken over by the Australian army. At times the showgrounds have been a source of friction between the Council and residents. When the Council wanted to sell the land in the 1970s, a battle to preserve the ten acres (4.1 hectares) was won in the Privy Council in London in 1979. In 1994, the Administration Block from the Cannon Hill Saleyards was moved to the showgrounds and restored. Muslim settlers began to enter the Mount Gravatt East area at the end of the 1800s. In 1908 Sam Watson built the Mosque in the Kahn's paddock on Nursery Road. The present mosque, complete with domed roof and minarets, was built in the 1970s with a gift of money from Kuwait. Mount Gravatt East State School started out very small, and was originally called Creek Road School. To reach the school, children had to cross a bridge that was often flooded. The track that developed between Brisbane and the German settlement on the banks of the Logan River wound along the flatter ground between Mount Gravatt, Pine Mountain, and Whites Hill. It may have been following the path that Aborigines had made over thousands of years. A few graziers ran sheep through the area, and William Slack used the road then known as Slacks Track to move cattle to market. As more people settled, the bush track became better used, and bullock and horse teams drove along it. After being surveyed in 1864 the track was renamed Logan Road. Cobb and Co provided a weekly coach to Loganholme until 1885, when the rail line to Beenleigh was opened. Hans Von Lippa walked out along the road in 1889 and said that 'the way was lovely but very lonely – I rarely encountered anyone'. Finally Logan Road was fully bituminised in 1931, prompting the raising of the speed limit from a sedate fifteen miles (24.2 kilometres) an hour. It may have been farming land that originally drew settlers to the Mt Gravatt area, but it was the major thoroughfare, Logan Road, that really transformed the suburb into a hub. Logan Road was actually originally known as 'Slack's Track,' after early settler, William Slack, used the track to move his cattle through the area. The track was renamed Logan Road after a survey in 1864. According to Brian Randall from the State Library of Queensland, Mount Gravatt itself has been a part of history since the early 1800s. "The first evidence we've got of Mt Gravatt in the record is the sighting and recording of the mountain by John Oxley, while he was doing his explorations in 1923-24," says Brian. Mt Gravatt was first named in about 1840, after Lieut. George Gravatt, who was commandant of the Moreton Bay Penal Colony in 1839. The early settlers in the area were mainly farmers, including a number of Germans who moved to Mt Gravatt in the 1860s and settled in the German Bridge area, towards Holland Park: the Glindemann, Dyer, Eikendorff, Lutz, Eberhardt and Steigmann families. The Steigmanns established a wine making business near the corner of the Logan and Shire Roads, while the Glindemanns established Glindemann's Highfield Dairy. A number of these settlers and other are honoured by local road names, including Glindemann, Toohey, Swain, Holland and Klumpp. Mt Gravatt Village was originally built to meet the needs of local farmers, traders and residents. Garden City was built in 1970. 1969 The last Tram at Mt Gravatt. FM430, 13 April .